Snakes are limbless reptiles that are found in a wide range of climates and terrains. All serpents are predatory, although mundane species typically feed on very small animals like insects, rodents, and the like. 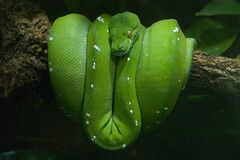 Monstrous snakes can consume proportionately larger prey and may pose a threat to humanoids, and even ordinary snakes can be deadly if they possess a venomous bite. Jadefang vipers are small, brilliant green snakes that rarely exceed three feet in length. They live in tropic forests and marshes, and are widely known for their highly venomous bite. These serpents aren't particularly aggressive and usually avoid other creatures if possible, but they bite without hesitation if cornered or provoked. They pose the largest threat to native inhabitants that regularly harvest from the fruit-bearing trees that jadefangs like to nest in. When a jadefang viper attacks from cover or concealment, it deal an extra 1d6 poison damage on a hit. Hit: 1d6 + 3 damage, ongoing 5 poison damage (save ends). If the target is Small or smaller, the target is grabbed. Hit: 1d10 + 3 poison damage, and ongoing 5 poison damage (save ends). Because they usually attempt to flee and hide before resorting to attacking, most jadefang vipers will go unnoticed until they strike, injecting an especially potent first bite thanks to lurking venom. Unlike many snakes, which bite once or twice in order to conserve venom, a jadefang viper will clamp on and continually use venomous hold to inject as much poison as possible into the victim's body. They don't generally let go until the victim stops moving — a popular legend tells of jadefang vipers that were found still attached to cadavers that had been dead for hours or even days. DC 15: Jadefang vipers are venomous serpents that dwell in the tree branches of warm locales. They usually feed on small rodents like rats and squirrels. DC 20: A jadefang viper will continue to pump venom into its victim until one of the two dies, so it is important to remove the snake as quickly as possible. The term venomspitter describes a variety of poisonous snakes that are capable of spitting their venom from a distance, unlike normal serpents which have to inject their venom by biting a victim. They are generally large and can sometimes grow to more than five feet in length, but they possess the slender body common to most venomous snakes. With the exception of certain tropical species, which may be a bright orange or yellow in coloration, most venomspitter serpents are a dull brown, grey, or black. Their head may possess a hood similar to that of cobras, but this feature is not particularly common. Though capable of climbing, these creatures prefer to remain on the ground unless they are pursuing wounded prey. Hit: 1d8 + 5 damage, and ongoing 2 poison damage (save ends). Hit: 2d6 + 5 poison damage, and ongoing 5 poison damage (save ends). Aftereffect: Ongoing 2 poison damage and the target is blinded (save ends both). Hit: ongoing 5 poison damage and the target is blinded (save ends both). A venomspitter serpent prefers to take down prey using venom spray, which keeps it away from dangerous creatures that might fight back. If a creature gets too close to the serpent, it attempts to retreat and spit again if venom spray has recharged; otherwise, it will bite the target and then retreat. They are extremely ornery creatures and will typically fight to the death. DC 15: Venomspitter serpents come in a wide range of colors, shapes, and sizes, but they are all poisonous and can spit their venom from a surprising distance. DC 20: These irritable creatures very rarely retreat, but may do so if they have recently fed or are currently carrying offspring. Otherwise, they will fight to the death, often leaving a wide swath of ground covered in venom. Dreadhood cobras are vicious predators that dwell in the dry, grassy plains of the world. They have a mottled brown or light black skin that helps them blend in to their surroundings when hunting prey. Their venom affects the minds of those it touches, making the victim more susceptible to the effects of fear, and the cobra can frighten nearby creatures simply by raising the hood that surrounds its head. They attack virtually anything on sight and will viciously pursue a victim until it is well beyond the cobra's sight. Hit: 1d10 + 6 damage, ongoing 5 poison damage and the target takes a –2 penalty on saving throws against fear effects (save ends both). First Failed Save: The target takes a –4 penalty on saving throws against fear effects (save ends). Aftereffect: Ongoing 2 poison damage (save ends). Hit: 3d10 + 6 poison damage, and the target is dazed (save ends). If the target is already dazed, it is weakened instead (save ends). Hit: The target is dazed and takes a –2 penalty on all attack rolls (save ends both). If the target is adjacent to the dreadhood cobra, it also falls prone. Although a dreadhood cobra can spit a concentrated blast of venom, it does not do so until extremely pressed; until then, it relies on its mindfire bite to take down prey. If two or more opponents are close, it uses flared hood to try to make them more susceptible to its attacks. Once bloodied, it uses poison the mind whenever it is able to and begins using flared hood even if it can only affect one foe at a time. DC 20: Dreadhood cobras are large venomous snakes that live in dry, arid climates. They are particularly common among grassy regions, where it can blend in easily. DC 25: A dreadhood cobra relies on its ability to intimidate and inspire fear in its victims. If robbed of this ability, it has to rely solely on its poison, which is not as powerful as that of other snakes. Irontail boas are fairly large snakes native to warm forests and swamps, although they can sometimes be found in more temperate regions. They are covered in grey or light brown scales, and possess the vertical eye slits more commonly seen amongst venomous snakes. Irontails are best known for their unusual method of self-defense: they possess highly developed stomach muscles that allow the creature to hold itself up in the air and flail its body around like a whip. An irontail boa's flailing is strong enough to knock down creatures twice its size and has even been known to break the bones of a full-grown human. This potent defense leaves the boa with few natural predators, so it often becomes an apex predator virtually wherever it chooses to live. Effect: +16 vs. Reflex; 2d8 + 6 damage, and the target is grabbed (until escape). Effect: The irontail boa makes a tail whip attack. If it hits, the attack automatically deals maximum damage to both the target and the irontail boa. Effect: Close burst 1; +12 vs. Fortitude; 1d10 + 6 damage, and the target is knocked prone. The irontail boa can use this attack when it has a target grabbed. When threatened, an irontail boa relies on its tail whip to keep foes at bay. If a target continues to approach the boa, it latches on with its bite and begins using deadly thrashing. DC 20: Irontail boas use their thick, powerful bodies as a whip-like weapon, flailing those who get too close. It also possesses a powerful bite that allows it to latch firmly onto its prey. DC 25: Though they prefer to avoid potential danger, irontail boas are not accustomed being preyed upon and are quite vicious if provoked. They fight with such aggression that they are willing to injure or even kill themselves in the process.